Die cutting equipment is one of Spartanics specialties. As an alternative to rotary die cutters or platen presses, Spartanics offers optically registered Steel Rule Die Cutting Machinery and Hard Tool Die Cutting Machinery that will deliver cut-to-print registration accuracy of +/- 0.1mm or better. 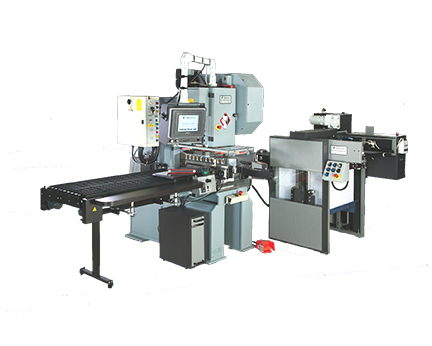 The modular design of Spartanics Die Cutting Equipment allows operators to change steel rules dies in minutes or switch to hard tooling, handle coil-fed or sheet-fed jobs. A wide array of input and output modules can be re-configured for job changing requirements. Die cutting equipment allows the same shape to be cut uniformly in various materials. This process is known as die cutting. The cuts that are generated from this process are referred to as blanks (examples: id cards, loyalty cards, financial cards, nameplates, gaskets,…etc). Steel Rule Dies include special sharp blades mounted to a die board for short run, quick change die cutting. Hard Tool dies are specially machined metal that include a punch and a die block for longer run, high volume die cutting of parts that require specific sizing requirements and very clean edges. Hard tools are also known as male/female tooling or Class A tooling. The material that is being cut is placed on a flat surface and the die is pressed into the material, resulting in a cut or blank. Our cut-to-print registration feed equipment integrated with a punching press ensures that each die cut part is exactly the same size and shape. Spartanics Die Cutting Equipment sets the standard and provides a strong competitive advantage relied upon by pioneering companies. The modular design and consistent cut-to-print registration accuracy will provide you with the flexibility and precision you need. Spartanics is able to customize each system with different pre-press and finishing options. For more information on how Spartanics can provide a solution for your specific needs, please contact us by filling out our ‘Contact Form’ or call us today – +1 (847)394-5700.